Tips for the iPod Holiday Gift Shopper: Where to Buy, How to Pay, etc. FEATURE: 11.30.07-- What could be worse than waking up and finding coal in your stockings on Christmas Day, a classic sign that you're on someone's (Santa's?) naughty list this year? Getting up in the morning to watch your loved one unwrap that new iPod classic you bought them--which you went through a lot of trouble to get--only to find a box of rocks inside. Which makes getting rocks in your socks not such a bad idea. Considering you'll be blacklisted by your loved one during every gift occasion in the upcoming year. Valentine's, birthday, etc. With reports around the web surfacing earlier this month, both confirmed and unconfirmed, about Target customers purchasing new sealed-in-box iPods that had natural paperweights inside, it finally gave us a bit of immediacy to a news item we thought about publishing last year at this time. With the first generation iPod nanos, the holidays, and yes, Target, front and center. Only thing was, we didn't think anyone would believe the story. But with these horror stories popping up about people getting their socks rocked off by Target, expecting less and paying more (contrary to their slogan, "Expect More. Pay Less.") --especially that unfortunate story of one woman who bought not one, not two, but three iPods that all had rocks substituted in them--we finally found the perfect time to release this piece. When the original stand-alone Target store in the city where this columnist resides closed its doors in October 2006, after building a new and bigger one in a neighboring city (and four years prior, a replacement store built as an anchor tenant at a mall just "inches" down the street, but never closing because the lease was still in effect at the original), deep discounts ensued. The store that was closing moved most of its current stock to the new store and to the other one just down the street. Everything else was marked down in order to sell it quickly. We of course, visited the electronics department to see what could be had at bargain basement prices. Video games, computer peripherals, music and DVDs, or even televisions. By that time however, most of it was gone. Sold to the person who got there before us, or moved to the other store. One thing that caught our eyes was a lone ranger locked up inside a display case. 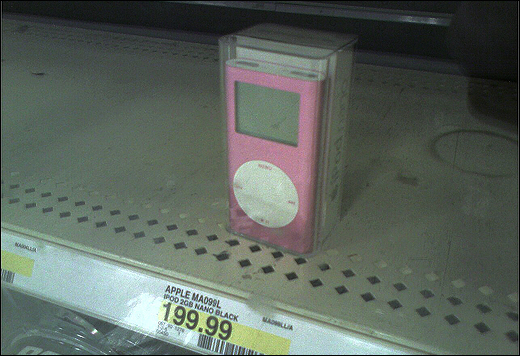 Sitting by itself in a clear plastic case was the new aluminum second generation iPod nano. Thinking it might be had for a huge discount, we took a closer look. But that's not what initially got our attention in the first place. Living inside the authentic Apple packaging labeled "iPod nano" was not a aluminum nano, but in its place? There was no mistaking the product inside. Yes, it was aluminum, but, it was an iPod mini!